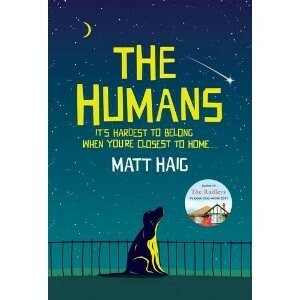 This is the first paragraph of The Humans, by Matt Haig. Written human languages are preposterously simple, as they are made up almost entirely of words. I knew Earth was a real event in a dull and distant solar system, where not a great deal happened and where travel options for the locals were severely limited. I’d also heard that humans were a life form of, at best, middling intelligence and one prone to violence, deep sexual embarrassment, bad poetry and walking around in circles. Humans, as a rule, don’t like mad people, unless they are painting, and only then once they are dead. …the universe was unlikely before it happened and it had almost indisputably happened. He carried the ugliness of his species better than most. At least he wasn’t looking happy about what he was, and that was something. To be a human is to state the obvious. Repeatedly, over and over, until the end of time. Names are the symptom of a species which values the individual self above the collective good. It was then I realized the one thing worse than having a dog hate you is having a dog love you. Seriously, if there is a _needier_ species in the universe I had yet to meet it. Maybe that’s what beauty was, for humans. Accidents, imperfections, place inside a pretty pattern. …it takes time to understand humans, because they don’t understand themselves. They have been wearing clothes for so long. Metaphorical clothes. That is what I am talking about. That was the price of human civilization–to create it they had to close the door on their true selves. And so they are lost… And that is why they invented art: books, music, films, plays paintings, sculpture. They interred them as bridges back to themselves, back to who they are. But however close they get they are for ever removed. …it was known to be the first rule of marriage: solve the mystery, end the love. So, families often stayed together. Wives sometimes managed to stay with husbands and put up with whichever misery they felt by writing novels and hiding them at the bottom of their wardrobes. Mothers put up with their children, no matter how difficult those children were, no matter how close to insanity they usher their parents. But at a ground level the humans don’t appear to spend their entire lives in a catatonic state. I breathed her in. I liked the warmth of her body against mine and realized the pathos of being a human. Of being a mortal creature who was essentially alone but needed the myth of togetherness with others. Friends, children, overs. It was an attractive myth. It was a myth you could easily inhabit. That’s what starts to happen, when you know it is possible for you to feel pain you have no control over. You become vulnerable. Because the possibility of pain is where love stems from. …social networking on Earth was quite limited. … [it generally involved sitting down at a non-sentient computer and typing words about needing a coffee and reading about other people needing a coffee, while forgetting to actually make coffee. A homo sapiens was a primitive hunter who had woken each day with the knowledge he could kill. And now, the equivalent knowledge was only that he would wake up each day and buy something. Love is what the humans are all about but they don’t understand it. If they understood it, then it would disappear. … All I know is that it’s a frightening thing. … Love is scary because it pulls you in with an intense force, a supermassive black hole which looks like nothing from the outside but from inside challenges every reasonable thing you know. You lose yourself, like I lost myself, in the warmest of annihilations. …I considered the glass. The glass had been distilled from rock and so it knew things. It knew the age of the universe because it was the universe. She put her arm around me. I did not know the etiquette. Was this the moment I was meant to recite poetry written by dead people or was I meant to massage her anatomy? …if getting drunk was how people forgot they were mortal, then hangovers were how they remembered. Laughter, I realized, was the reverberating sound of truth hitting a lie. This is a planet where a daydream can end in death, and where mathematicians can cause an apocalypse. Given the absence of mind-reading technology, humans believe monogamy is possible. In every life there is a moment. A crisis. One that says: what I believe is wrong. It happens to everyone, the only difference is how that knowledge changes them. In most cases, it is simply a case of burying that knowledge and pretending it isn’t there. That is how humans grow old. That is ultimately what creases their faces and curves their backs and shrinks their mouths and ambitions. The weight of that entail. The stress of it… The single largest act of bravery or madness anyone can do is the act of change. That was part of being human, I discovered. It was about knowing which lies to tell, and when to tell them. To love someone is to lie to them. …once you had tasted truth and love in the same potent cocktail there had to be no more tricks. 57. There are lots of idiots in your species. Lots and lots. You are not one of them. Hold your ground. 62. Start fires. But only metaphorically. Unless you are cold and it’s a safe setting. In which case: start fires. 73. No one will understand you. It is not, ultimately, that important. What is important is that you understand yourself. 86. To like something is to insult it. Love it or hate it. Be passionate. As civilization advances, so does indifference. It is a disease. Immunise yourself with art. And love. “I am such a human, ” I told my espadrilles. To experience beauty on Earth you need to experience pain and to know mortality. That is why so much that is beautiful on this planet has to do with time passing and the Earth turning. I couldn’t think of a better purpose for the universe than for her to be in it. Sentimentality is another human flaw. A distortion. Another twisted by-product of love, serving no rational purpose. And yet, there was a force behind it as authentic as any other. “I first had the idea of writing this story in 2000, when I was in the grips of panic disorder. … The only thing I could do to gain a degree of calm was read. It was a breakdown, of sorts, though as R.D. Laing (and later Jerry Maguire) famously said, breakdown is very often breakthrough and, weirdly, I don’t regret that personal hell now. and spend the rest of today devouring this book. “I did not. I gave you a taste, a lick, a sprinkling. And you need to immerse yourself, disappear in its pages, let it transform you. Now stop wasting another minute of your remaining 15,000 days on this planet, and GO GET THE BOOK.